Their provocative book takes us into a dimension where we shed our assumptions of leadership, dominance, and control, convincingly showing a way forward that acknowledges that a horse, when allowed, is driven by his own inner motivation to explore and understand the world around him, including his relationship with humans. 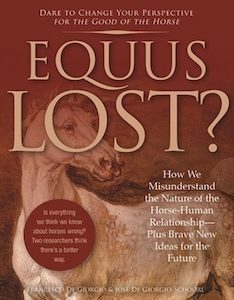 NWHS Editor’s Review: The subtitle of Equus Lost is How We Misunderstand the Nature of the Horse-Human Relationship – Plus Brave New Ideas for the Future. The authors challenge and dismiss many of the common attitudes and methods in horse training. Reading it was mind-expanding and made me question much of what we do with horses. Equus Lost is not a light read; I found myself reading and re-reading passages. The concepts the authors put forth are certainly worth exploring.